Maryanne’s musings: Soooo there is a genius motive for why they shy 😉 I guess the future becomes like Planet of the Apes. 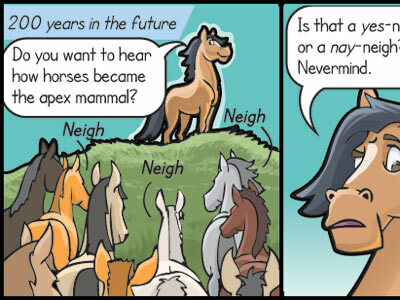 But with horses. I originally had a zoomed out horsey head in the last frame but it didn’t fit with all my writing and I liked the idea of the carrot bit being dropped in after a beat. I had to resize a few eyes. I had them too big. I mean, they’re still big. It’s funny to think they were bigger. I also had more horses in the crowd, but it was too many. There’s probably still too many.